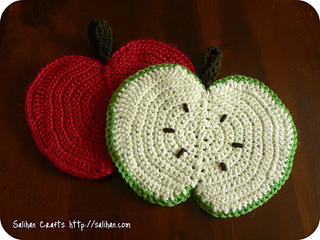 This apple dishcloth is crocheted using acrylic yarn which gives it extra scrubbing power. It also dries a lot quicker than cotton yarn. One side is red or green and the other is white, just like the inside and outside of an apple. The two sides are crocheted together leaving you with a thick, cushy dishcloth. 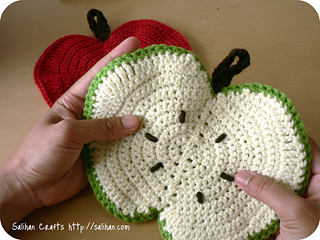 This also makes a good sized potholder if you use cotton or wool yarn.